Armenia has a rich prehistory, and here we offer an introduction to some of the most important sites and the most important periods. We begin somewhere around 3000 BC when a rich agricultural culture was established throughout much of the Caucasus. This is often known as the Kura Araxes culture, and one of the biggest and most excavated sites is that at Shengavit, which we discussed here. We begin by looking at Lake Sevan, and particularly the site of Lachashen, where a number of these wooden wagons have been excavated. We then go briefly a very rich site of Karashamb, before moving onto the recent excavations at Upper and Lower Naver, or in Armenian, Nerkin Naver and Verin Naver. We end up looking at some of the hillforts which mark a more warlike end to this period, at Lachashen again. One of the most extensively excavated sites of this period is the rich mining site at Metsamor. Here we look not only at the mining, but also at the ritual aspects, and particularly the rocky outcrop nearby which is covered with rock carvings, and which is therefore sometimes considered to be an ancient ‘observatory’. We look at the museum, with its ‘Gold room’ with a display of some of the jewellery excavated from the very rich cemetery. And last but not least there is the magnificent display of standing stones, erected outside the museum (see above). One of these is a ‘Vishap’ stone,a fish-shaped stone of a type found widely in the Armenian highlands, often near the sources of water. And then there is the spectacular row of phallic stones, many of them excavated in barrows. 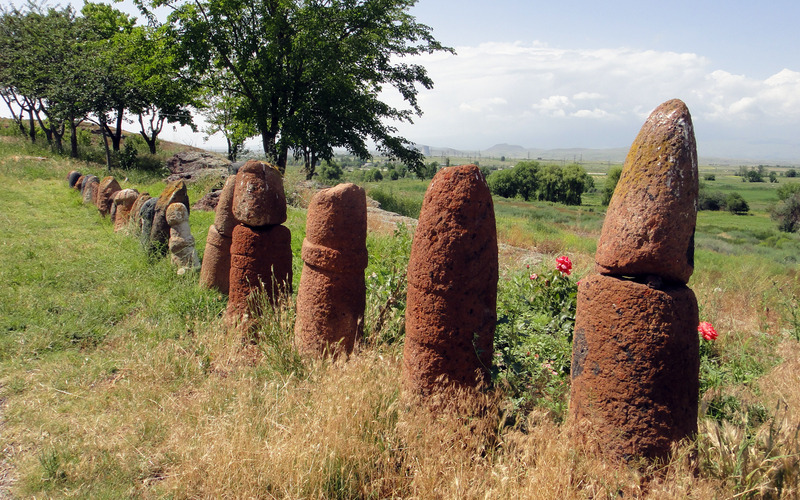 These were erected by the Urartian warriors to show off their prowess: they may have been terrifying in battle, but by God, they were even better in bed! This is followed by a look at the rise of the Uratu, and the sites of Erebuni and Kharmir Blur.